It's been a bit under two weeks since the Clan Raukaan supplement for 40K was released, and I think it's time to take a look at it. Naturally, being the Iron Hands enthusiast that I am, I picked it up. After dealing with the frustration of GW's poor support for non-iPad versions of their books, I read it from end to end pretty much in a single day. What did I find? Well, let's go through this section-by-section. The largest section of the book by far, as with the rest of the supplements. Also as with the rest of the supplements, it's obvious there was little, if any revision made, and what's presented was the original draft hastily written. Spelling mistakes and grammatical errors abound, the narratives feel disjointed and sometimes lack cohesion, and just generally feel amateurish. These pale in comparison to the actual content, however. I've been a fan of the Iron Hands for upwards of ten years, ever since I read their original Index Astartes article back during 3rd edition. Their outlook and character, as well as that of their primarch, had a definite influence in my own development: good or bad, I abhor weakness, especially in myself, and I constantly try to push my limits and become stronger/better in all things. Over the years, I put up with the fluff for them otherwise being non-existent or terrible (i.e. the original novel that came out about the same time). Wrath of Iron and Flesh came out last year, both by Chris Wraight, and it seemed like we were finally getting some decent expanding. The character was captured perfectly and they were well-written. Sadly, Chris doesn't write for the rulebooks. I'm not sure who wrote this one, but I'm told it was Mat Ward once again. Once again, he's managed to piss people off. The fluff in this supplement is, in a word, atrocious. In many more words, it's a drastic shift away from what the Iron Hands used to be, including heavy doses retconning and stripping away of much of their character. Let's go through a short list of some of the more egregious changes. The organization is totally different. Previously, the Iron Hands were divided into ten more-or-less identical Clan-Companies, each responsible for their own recruitment and upkeep, and based on one of the ten Clans of Medusa. Essentially, the Iron Hands were almost more like an alliance of ten mini-Chapters than a unified Chapter. There was no Chapter Master, as they didn't want to allow one person's weaknesses to doom the entire Chapter, and instead they had a Clan Council made up of the leaders of each Clan-Company, which was typically either a Clan-Commander, an Iron Father, or a Dreadnought Warleader. That's all gone. 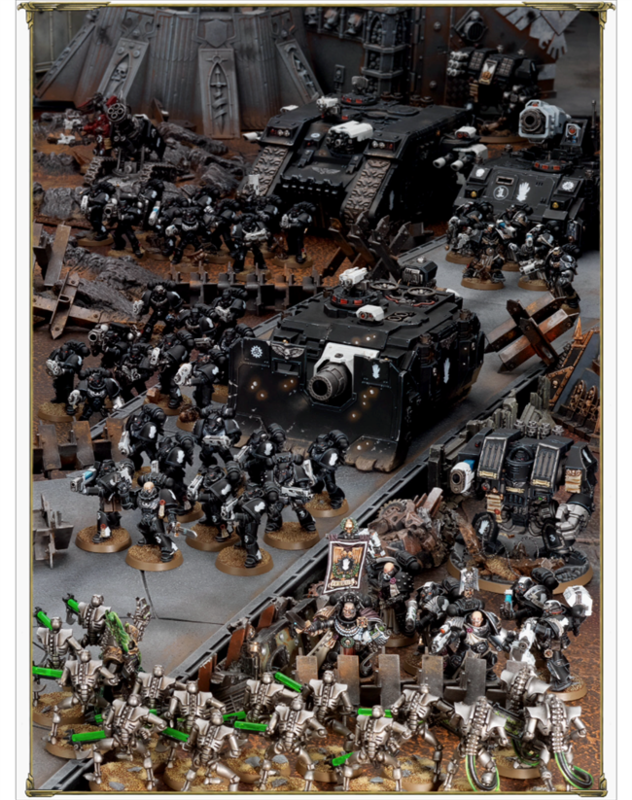 Now the Chapter is entirely codex-compliant, with Veteran, Battle, Reserve, and Scout Companies, they just happen to use Clan names instead of Company numbers, there's more than ten Clans on Medusa and Battle-Brothers will shift between Companies entirely on a whim, and the Iron Hands also recruit from off-world. The Clan Council still more-or-less exists, except now it's made up of 41 selected members known as the Iron Fathers. Iron Fathers are basically gone. They were originally a sort of hybrid of Chaplains and Techmarines (something distinctive to the Hands), however now it's merely an honorific bestowed to anyone that's chosen to serve on the Clan Council, which could be anyone. Except Dreadnoughts. Dreadnoughts aren't allowed on the Council. Nor are they allowed to lead Companies. Because that makes sense. They're the same as Dreadnoughts in any other Chapter, despite claims of still being revered. Speaking of leadership, the Iron Hands now have a Chapter Master. Or at least they'll elect someone to lead the Council for a year at a time, except the current guy has been re-elected for three centuries now. So much for a temporary measure or avoiding having a single leader. The entire concept of squad sergeants wearing Terminator armor to bolster morale is gone. I kinda saw this one coming though, and this is probably the least of my complaints. The loathing of weakness and unyielding determination is now frequently portrayed as serious character flaws (kinda like Sentinels of Terra showing the stubbornness of the Imperial Fists being a serious flaw because it constantly gets whole Companies needlessly wiped out), the Iron Hands are often shown to be somewhat hypocritical and, if anything, weaker that most other Chapters because of how they feel regarding weakness, and they even hold their primarch in contempt to some level. They constantly bicker and fight to the point where their efficiency suffers, and it's their very logic that sees them nearly wiped out by the Sapphire King. So basically the very things that make them and Ferrus Manus awesome are portrayed as vulnerabilities here. Ugh. But then, in the last couple centuries of the 41st Millenium, they suddenly figure out that emotions aren't so bad after all, and they should use them more. I'm actually less upset about this one, because the way it's explained falls in line with my personal philosophy; that emotions, if properly controlled and harnessed, can be VERY powerful assets, it's when they get out of control, when that balance is distorted, that you become open to weakness (and indeed this is about how my Lords of Oblivion have operated from day 1). However, I can certainly empathize with other fans that see this as a fundamental betrayal of the nature of the Iron Hands. Wrath of Iron didn't happen. That's right, the one good novel the Iron Hands got has now been retconned out of existence. Arven Rauth never led Clan Raukaan (or even existed, apparently), and the Purging of Contqual never happened (nevermind the mild irony of the supplement actually having the cover art from Wrath of Iron on one page). Instead it's lead by a small group of senior officers. I should add there are still a few decent points. There's some new material regarding how the Chapter operates and details about its relationship with the Mechanicum that's decent enough. Additionally, I actually kind of like the arc with the Sapphire King. Essentially it's a daemon that was born from the release of all of Ferrus Manus' pent-up emotions when he died (although I could have sworn he had no trouble showing his feelings most of the time), and feeds off of the emotional repression of the Iron Hands, haunting them over the millenia and often employing Emperor's Children to lure them into traps and otherwise do battle with them. It's a physical embodiment of their darker side, I suppose, though I'd swear Ward just ripped off my own fluff I wrote years ago about Faldred the Foul and his Emperor's Children constantly hunting the Lords of Oblivion, it's practically the same story with different names. Another change is all the Clan-Companies are finally named. Not surprisingly, my Clan Karaashi is not among them. Furthermore, the symbol I've been using (the sundered mountain) has been officially designated as belonging to Clan Vurgaan. So, I guess I need to decide what I want to do. I guess I can just rename my army to Vurgaan, but...ehh. I dunno. No codex is complete without a gallery of heavily-Photoshopped pictures of models! A lot of the models here are the same ones from the core SM codex from new angles, though there's some new models in here. Overall, it's kinda...meh. The models don't even match the artwork (the shoulder pad rims are black instead of silver), and nothing about them really pops out to me the way my own models do. I think it's that there's too much white, and virtually no blue whatsoever. I dunno. They just look like black Space Marines to me. It's probably the lack of bionics, too. There's really none to be found in that picture. And while I can't fault GW for using nothing but their own plastic kits and standard decals for their studio armies, I'd have to say the Iron Hands REALLY benefit from some older-style Forge World parts, and the FW decals are just significantly better in detail, especially with the Chapter logo. On the plus side, there's a decent bit of new artwork scattered around the supplement, and most of it is decent. There's some example Marines from different squads, which helps show markings, and there's one particular piece somewhere in the fluff section showing them attacking some Eldar that I especially like. The perspective on it is really well done and feels a lot more realistic than a lot of the artwork that's just "thousands of blurry figures fighting across miles of battleground" like a lot of it is. Now we come to the book's one redeeming grace. The rules are, in fact, actually pretty decent. The Warlord traits are fairly good, though I think in my case I'd want the lower number ones. Number 6 is nice in general, but not if your Warlord is a Terminator Captain attached to a Terminator Assault Squad with no guns, heh. There aren't any changes to the Chapter Tactics, merely some FOC tweaks, in that any Dreadnought can be automatically taken as an Elite or Heavy Support, and you can now take two Techmarines per other HQ choice instead of one (three if you have a Master of the Forge). Fairly lackluster, if you ask me. The relics are pretty nice, at least. The Mindforge Stave basically gives you a force Thunder Hammer for 15 points, which gives some interesting combat options not normally available to a Librarian. The Axe of Medusa can be a good choice for a Chapter Master, being a master-crafted +2S Axe that hits at +4S on a To-Hit of 6. For 30 points, the Ironstone makes vehicles around the bearer much more likely to self-repair and even gives them a chance to restore weapons or mobility. If you run a vehicle-heavy army (which seems unlikely in the current meta-game, but still possible), this seems like a good choice. The Gorgon's Chain REALLY appeals to me. It's 45 points, and its effectiveness depends on how many wounds the bearer has left. If the bearer is unwounded, he has a 3+ INV save, +1 to his Feel No Pain rolls, and Eternal Warrior. The benefits slowly fade as you take wounds, but it's nothing particularly bad. Combine this with the +1 FNP warlord trait, and he's making those on 3+. Thankfully, the effects can also be restored if he passes an It Will Not Die roll. I would definitely take this over the Shield Eternal from the core book, but I may need to remodel my Clan-Commander if I do. Finally, the Tempered Helm, at 35 points, gives the bearer a 24" leadership bubble (all units within can use his leadership), as well as the ability to nominate a single friendly unit within 12" each shooting phase, which can then re-roll To-Hits of 1. Definitely a useful item. There's the usual assortment of Planetstrike and Cities of Death additional rules, but I'm going to skip those because, let's face it, nobody plays those. There's also an Apocalypse formation for the entire Company, but somehow I get the feeling I'd be able to count on one hand the number of people who would own everything needed for this, so skipping again. There are, however, three new Altar of War missions. These intrigue me. I like the idea of having a slightly off-the-wall mission designed around one player using a specific army, and facing a specific tactical challenge for that army. I haven't had the opportunity to try any of these missions yet, but I would definitely like to try them. The Echoes of War missions are your usual thematic battles, but I find them less interesting. I've just never been big on "historical" battles where the outcome has already been established, for the same reasons I don't like playing historical wargames. So, the Clan Raukaan supplement is very much a mixed bag. Overall, I'd say it's more bad than good with the almost total desecration of the fluff and everything that made them unique in the past. And I know it's not just me, the wider community reaction has been less than positive, as well. Not surprisingly, there's considerable argument about what to do, with many players choosing to simply "ignore" this book and retain their old ideas of what the Iron Hands are. I don't blame them, and I feel largely the same. The Iron Hands as they were presented in Wrath of Iron and Flesh, THAT'S what they are to me. Not the watered-down Ultramarines wannabes with daddy issues as they're shown here. The Iron Hands are far from the only army to get this treatment, and I'm especially disappointed after reading the exceptional fluff in the Iyanden and Farsight Enclaves supplements. I know GW is capable of expanding the background of more obscure armies and giving them good background material. They've done it before. Ahh, well. The gallery is meh. There's nothing special in there. The rules are at least halfway decent. Or at least the relics are. The Warlord traits are hit-or-miss for me personally, but I can see most of them being useful for other players. So there's that at least. What do I plan on doing? I plan on enduring, of course. I'm going to carry on with my army and stick to the Chris Wraight fluff for them. Talok Vorrax is a Clan-Commander, not an Iron Captain. His Clan-Company is self-sufficient, with its own Veterans and Scouts. I still have a proper Iron Father, even if it's not quite possible to truly represent him rules-wise. As far as good rules AND fluff goes, there's at least what's in Horus Heresy Vol II: Massacre. The Iron Hands are still well-represented there, at least. Perhaps I just need to start playing 30K instead, heh.